When the owner, and designer by trade, of this Des Moines, Iowa, home wanted a new fireplace surround, there was one request: make it a surprise. With that in mind and the prevailing style of the home, Jeremy Speck, of Speck USA, knew what direction he wanted to head. While there is an obvious contemporary feel to the concrete terrazzo fireplace surround, there is an understated notion as well. 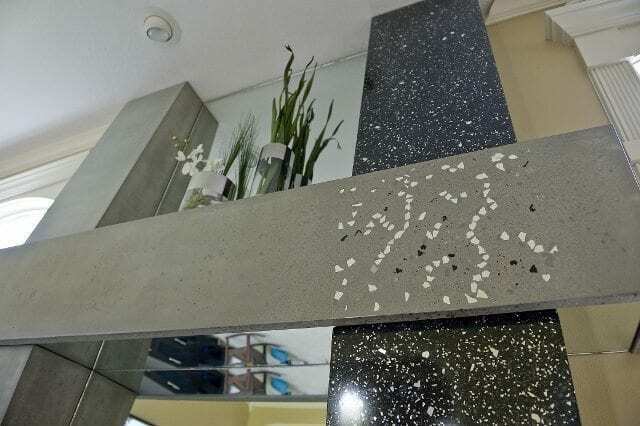 From left to right, the terrazzo fireplace surround reflects the changing vision of concrete: from standard, grey, and lackluster to eye-catching, colorful, and polished. This custom concrete terrazzo fireplace surround is comprised of six individual pieces, each from a custom made form. For the grey components (left side columns and mantel), which represents the old vision of concrete, Jeremy and his team used SureCrete Design Products’ XS PreCast Mix and Modifier. Dove Grey color packs were added to this easy to use two part system. These pieces were sealed with a matte finish. 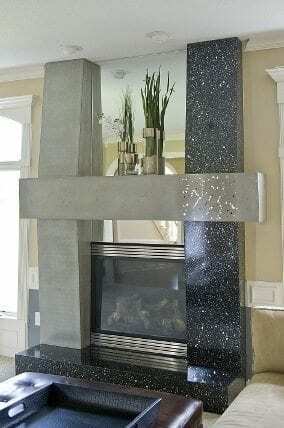 The collision of old and new is highlighted by the mirror fragments that peak through the “old“ concrete where the mantel intersects with the black columns on the right. These fragments of recycled glass mirror were actually adhered to the form before the mantel was poured to insure they would stay in place exactly where needed. 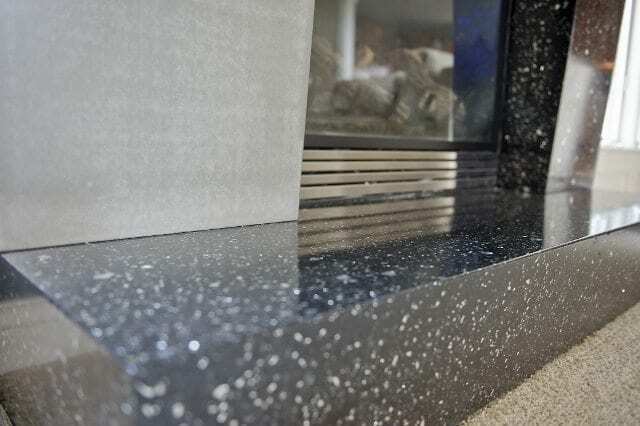 The black terrazzo components (right side columns and hearth) of the fireplace surround, which represents the modern application of concrete, are made up of Xtreme Series Terrazzo Mix, charcoal color packs, and recycled mirror and plate glass. SureCrete’s Xtreme Series Terrazzo Mix requires the addition of at least 50 pounds of aggregate and can accommodate up to 80 pounds for each 50 pound bag of Terrazzo Mix used. These pieces were sealed with a gloss finish adding contrast with the matte finish of the grey pieces. With the exception of the hearth, which rests on a wooden frame, all of the 1¼ inch thick pieces have foam cores and are fastened to the wall on a system of steel brackets and pins. This striking concrete terrazzo fireplace surround of approximately 120 square feet was completed by the Speck USA team in three weeks.